Good Bye Apartment Living, Hello First Home! You are here: Home / Parenting / Good Bye Apartment Living, Hello First Home! I’m excited to announce that today the Smith family said good bye to upstairs neighbors that apparently enjoy jumping rope with techno music blasting in the background at 2 in the morning; to having to play real life Tetris on a daily basis with our furniture in order to fit it all in, and sadly….to maintenance men at your beck and call. That’s right, we’ve finally said good bye to apartment life, and picked up the keys to our first home. Baby Noah had a great time with our lender during the closing. After buying baby Noah his first rody horse, it was clear that our two bedroom apartment (one bedroom / one office) wasn’t going cut it. There was hardly any room for Noah to have tummy time, much less learn to crawl! I had always heard house shopping was a stressful task, and that it difficult to find a home, but I have to say it couldn’t have been more easy; we seriously found the perfect house for Noah to grow up in!Also it’s not the house hunting that stresses me out…it’s moving in general. In fact, that’s one of the main reasons we’ve put off buying a house for so long. We both hate moving! Seriously, the thought of having to pack up our entire apartment makes me a little sick to my stomach. After our closing we swung by our new home to scope it out without having our (very nice) realtor with us. It really was awesome putting that key in the door, and walking into our very first home as a family. I just kept thinking about all the wonderful things that would happen in our house. Noah would learn to crawl here….learn to walk here…say his first words here. Wow. What a blessing. Looking forward to watching our son grow up here. Afterwards we headed over to The Home Depot to pick out some paint for a few of the rooms. Now let me just fill you in on a few things you may not know about me yet. I’m not your average manly-man. I don’t watch sports. I don’t like to work on cars. And I much prefer Best Buy to Home Depot. I’ll even go on record and say, I even prefer Babies R Us to The Home Depot. Any. Day. Of. The. Week! Shhhhhh…just don’t tell my wife. Little did I know how much time I would soon be spending at The Home Depot. One great thing about apartment living….24 x 7 maintenance men. I would soon come to learn just how much I missed them. While we were cruising the aisles looking for paint I decided to test out all of that hard work Noah’s physical therapists have been doing to help Noah strengthen his core, and see if he could sit up in a shopping cart. And I’m glad I did because he rocked that shopping cart! He was a little wobbly, but he did great. I was so proud of him. Look at that great head control! For those of you not in the know, one of the main physical characteristics of Down syndrome is hypotonia, or low muscle tone. (Which also means that children born with Down syndrome give incredible hugs! Noah seriously melts into you like butter….I love it!) So kids like Noah typically have to work really hard to develop the muscles needed to sit up (and stay up) on their own. And it’s only taken Noah 9 months to be able to ride in a shopping cart without falling over! This kid has abs of steel! Well now we start the nightmare process that is known as moving. It’s all good though. I’m at the best place I’ve ever been in my life. 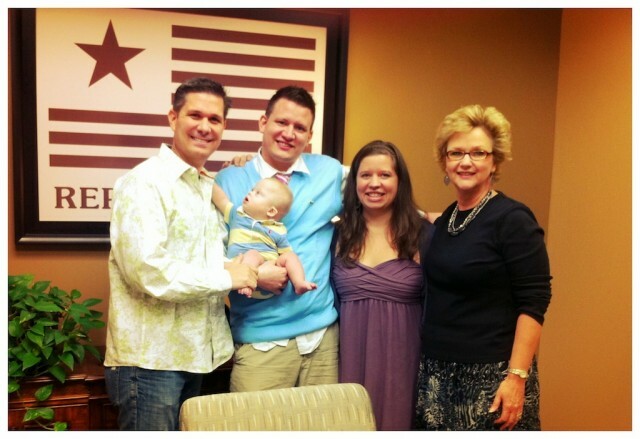 I have the most incredible family I guy could ever ask for…and now we get to continue our life in our first home. Life is good. I can’t wait to continue to share our story with you. Thanks for following along on our journey. Do you have any funny ‘first time home buyer” stories? (The movie “The Money Pit” comes to mind.) Please share your story in the comments below. That’s a beautiful home! Looks like Noah will get to try out his stair-climbing skills, too! We moved from a duplex to a “real” home two years ago. It’s a 50-year-old home, but it was completely remodeled before we moved in, so it’s lovely. No Money Pit stories here! It’s all wood flooring, which is great for potty training…not so great for learning to crawl! We’ve got lots of rugs! That’s awesome, so glad to hear about your home. It sounds like a great house! My wife is a huge fan of hard wood floors! Congratulations!!!! What a beautiful home!! I’m so happy for you.There’s nothing like having your own home. Your own little piece of the world where you are safe and happy and can do what ever you want! Best of luck! Not that you weren’t safe and happy in your apt!! that came out wrong i think. But I remember moving from our apt to our home, and nothing beats it! my husband and i hated home depot. really, whats the fun about it? we also livedi in an apartment tho we didnt had maintenance men, but really how much maintenance needed? not much. we bought our house some years ago, and i love moving, so my husband just had to relax lol. congrats on the new house! looks beautiful , too bad im far, if not i would gladly help moving if you babysitted my kids 😉 he! Congratulations on your beautiful new home! Our little Jarrett is a Pro-roller as well. He can roll anywhere he wants to go now…which leaves little motivation for crawling – but we are working on it! I love all of your videos and keeping up with Noah! What a cutie! …and Jerrett sounds like an awesome little dude! How old is he? Jarrett was born 12/2/10 so he will officially be 14 months old tomorrow…I just posted a picture of him on Facebook. He is a totally awesome little dude…he charms positively every person he meets! We hate moving, too…and I’ve only moved a couple times in my life (that weren’t for college). Throw in the fact that I’ve inherited two households worth of stuff (and two houses), we have a lot of stuff. I rue the day when we build our new home and have to move…I’m not looking forward to going through everything and packing and moving. It’ll be nice for Little Man, though…oh, and he loves watching videos of Noah. He gets all smiley and keeps pointing at the screen. It’s adorable. Congratulations on your first home. It’s beautiful. I missed the 24/7 maintenance men too. We are on a first-name basis with Home Depot now, sadly. Noah is doing great and so very cute. How awesome for you guys!!! Your family will have some incredible memories there!!!! Congrats guys! We also signed the papers today for our first home! Good luck! Congratulations! It’s so exciting to turn the keys on that first home. 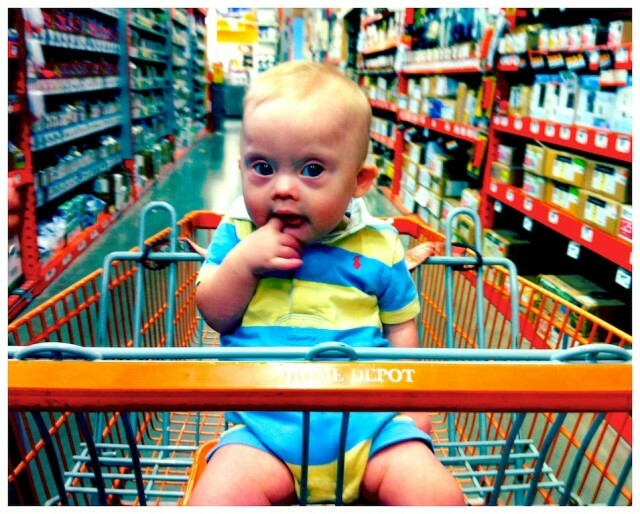 And a big YEA for Noah and the shopping cart experience! I bet he was a huge hit at HD….He’a such a cutie patootie! Congrats! We chose the easy road when we needed a larger space and bought my childhood home from my parents. Talk about roots! We are so grateful to be settled in a place to raise our 4 kids (jack, 30 months, sports designer jeans.). Love your blog! Thanks for all your great advocacy! First of all — your new home is beautiful! I’m sure you will be so very happy there. As for First Home Experiences — my first home in So. California was so close to the neighbor on one side that I literally heard the guy in the bathroom in the morning (just like an apartment! ), heard him snore at night. THEN no sooner were we there but moles decided to dig up every inch of the back yard — we had holes EVERYWHERE. Sometimes when I had a sprinkler out in the yard water would go down one hole and up another. It was quite interesting…but it was better than apartment living a few feet from an off ramp on the freeway! That is the cutest picture ever. Love it. Sorry know your post was about your home, lol. But the little guy just steals my heart everytime. Our son is 6 months with DS and EVERY single time you pick him up he smiles the hugest smile ever. How can you not love that!!! God is amazing. Blessings on your life at the new house. Wow! Congrats to you and family! It will be fun to follow what you do with the house. Looks awesome now though so can’t wait to see! Blessings over your entire house, room to room, top to bottom! May you know more and more the love of Christ and His provision as you enjoy your home together. Congratulations on the new house! Turning that key for the first time is so exciting! And a big YEA to Noah for that first shopping cart ride; I’ll bet he was as proud of himself as you were of him! He’s such a cutie patootie! This is my first time leaving a comment but I’ve been following y’all for a few weeks on FB and here after my friend at work told me about the blog. We have a 6 yr. son (Will…. who is appropriately named because not only is he God’s Will, he’s also very strong willed!). Your story is so much like ours and so much like other parents I know. Rest assured that many of the fears, anxieites or worries about the future are perfectly normal…..as is the overwhelming love, joy and happiness you get every time you think about your child (which is always). Sometimes I feel like the luckiest parent in the world because I literally have an angel living with me. I would one day love to share our story with you because it truly is a testimony to the power of God and the plan He has for us, but it is a long one and it’s late so I’ll save it for another time. I just wanted to congratulate you on your new home and thank you for creating a “family” of sorts through your blog and on FB. I hope we get to meet your beautiful family in person one day and that Will can have a chance to play with Noah. Oh, BTW, Will didn’t walk independently until he was a little over 2…..but within weeks he was literally running so fast that we couldn’t keep up with him. He won his first ribbon (1st place) at the Special Olympics last year….25 meter dash and he blew away the competition. I don’t know that he actually knows how to walk anymore because his feet hit the floor running in the morning. I see a marathon in his future!l God bless y’all! You did the right thing by waiting until AFTER the baby to buy the house. We moved into our first house, and two weeks later, Corbin arrived a month early! We hadn’t even unpacked yet (and we STILL haven’t painted Corbin’s room – I’ve started having dreams about it because it is bugging me so much). Your house looks gorgeous – congrats! 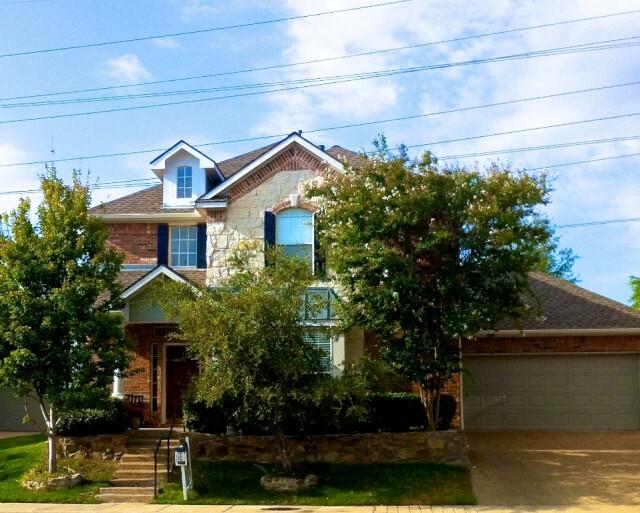 Congratulations….. you will truly enjoy making memories in this beautiful home…. our Great Grandson Warren and his family will be moving into there new home in the next week or so… much painting and etc.. to do first…. they are so excited…. so we know how you must feel…. hip hip hooray! Gigi. Congrats! Looks like a beautiful spot. Thanks, we are really enjoying it! By the way, your screen name is interesting. Do you work with border collies? What do you do wit them? Congrats on your new home, we moved into ours about 35 years ago. My one piece of advice is to use screws where ever possible (and 18v drill is a must) it is much easier to take apart when you find that it is not quite right. Just make sure you learn to prioritize your projects to keep time for Noah. One other piece of advice get your buddies involved with your projects, gets them done faster and with luck some of them will be more experienced and you not have to learn by your mistakes. Good luck and I’ll be watching out for Noah as he progresses. We just picked up the keys to our first house on Tuesday. 🙂 There were some last minute hiccups, but as I explained to our realtor and our mortgage broker, thanks to Warren I have to be organized with paperwork. Having a baby with special needs (and our last name gets misspelled often, the first time half his records with the cardiologist were under our name misspelled), navigating IEP meetings, and dealing the the social security office on a regular basis mean my paperwork box is super organized. Anyway, we were able to deal with the last minute issues and I’ve been to home depot 7 times since then. I’ve been painting while Warren hangs out with Daddy, I’m sure he’d really love to splash around in the paint, but that would throw off our schedule. 🙂 Warren’s new challenge is going to be stairs. In order to get into the house you have to walk up about 15-20 stairs from the garage or to the front door. He hasn’t spent alot of time there yet, but so far he’s doing great! Anyway, we’re super excited! Moving from an apartment means there is room for a few more little Smiths in this world LOL!! Only teasing! Enjoy you lovely new home – wishing you guys every blessing and happiness living there! I just wanted to say God bless you and your family!!!! Keep up the good work and have faith he make the impossible possible. Thanks! I appreciate the kind words. Do you have children? If so what are there ages? Yes I do….one just turned 7 months and the other is 5 yr old, and both are boys. Congratulations on your new home! We recently bought a new home as well! Emma Grace is the reason why my husband and I got into gear and bought a house. I totally get (and miss) having 24/7 maintenance available. Moving was a mission with me 8 1/2 months pregnant, both of us working, and with our 22 month-old daughter, Ava. We closed on our home April 12th, got the keys April 13th, moved in, had our baby shower April 22nd, and went into labor April 23rd!!! Emma was due May 2nd, so she was earlier than we expected. We thought we had an extra week or so, but she had her own plan! We had Emma that night at 10:00 pm on the dot and 12 hours later, our pediatrician was in our room telling me (my husband had gone home to trade with my mother watching Ava) that Emma had Downs. I felt like I had gotten punched in the stomach by Mike Tyson. The doctor insisted he be the one to break the news to my husband, so he came back when my husband did. Watching my husband hear the news for first time after I had heard the news just earlier was like getting punched again. In my mind, this was not supposed to happen: we just bought our first home, we were eagerly waiting for our second daughter, and all these great things were happening in our lives; why us? Our life as we knew it would never be the same. Emma’s doctor immediately had an echocardiogram ordered, blood drawn, and kept us an extra day. Emma’s heart came back healthy, she pooped just fine, and taking her bottle just fine.Waiting for the blood test to come back was hard. We kept googling and comparing Emma to Ava when she was born (they look very much alike!). I looked for any bit of information that could have disproved the pediatrician’s findings. I was constantly lost in thought, going through the motions until we got the phone call with the results: extra chromosome for sure. It’s ironic, but I thought that hearing the test was positive would crush me, but it did the exact opposite. We had closure. My husband and I dealt with the news and moved on. Acceptance, finally. We both dove right into looking for information on who to contact, therapy, etc. Emma is a month now. In this month, Emma has done more for us than we can possibly imagine an itty bitty baby could do for us. Emma is the reason we are homeowners now, the reason why we are seeking God more (we have always talked about being more involved in church and praying more),and the reason why our relationship has improved. We have a lot ahead of us, but this little girl is amazing to me. My husband has his work cut out for him: two daughters plus me! He is sooo outnumbered! I came across your blog when we first learned of Emma’s diagnosis, but I could not read it without crying since I was still waiting for the results. Thank you for what you are doing! Love reading about Noah on fb. He can put a big smile on my face. We can’t wait to file our income tax, so we can put a down payment on first home. So I am so excited and the kids can’t wait either.